The BBC has launched its marketing campaign for the 2018 FIFA World Cup to be held in Russia. The campaign, created by BBC Creative with BBC Sport Marketing and animated by Blinkink, journeys through World Cup history via the skill of Diego Maradona, the flair of Zinedine Zidane and the emotion of Paul Gascoigne, to a preview of the most exciting talents of this year’s finals including Cristiano Ronaldo, Lionel Messi and Harry Kane. 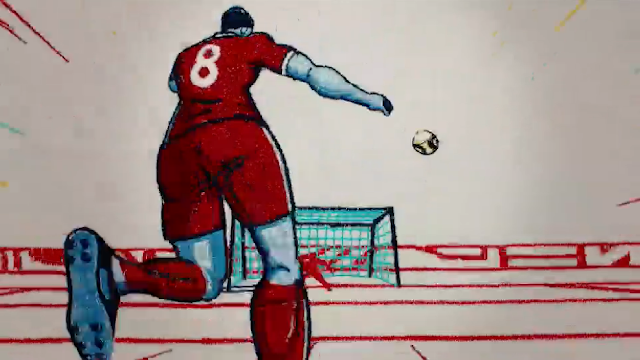 Animated launch film The Tapestry, directed by Nicos Livesey, takes us on a journey through iconic moments from the competition’s illustrious past, and introduces us to the faces that will surely create memories this time around. The team have modernised the traditional tapestry technique by creating a dynamic film in which every single frame has been individually embroidered. More than 227,000 metres of thread were used to create over 600 unique frames of tapestry, that if laid end-to-end would measure over 1,200 metres in length. This visual style will then become the look and feel for the BBC’s coverage, extending into programming graphics, website design, social media, BBC One’s look, and more. The idea will be fully realised in a real 7-metre long tapestry that will be put on public display. Moments from this year’s competition will be added to the tapestry after the tournament’s completion, creating a historical record of the 2018 World Cup. More details of this will be announced in due course. The launch film’s accompanying music is Ochi Cheryne - a traditional Russian folk song in keeping with the historical theme of the campaign. The song was recorded at Abbey Road Studios, arranged by Alex Baranowski, and features distinguished bass-baritone Sir John Tomlinson alongside a 40-piece orchestra. The lyrics speak of unification and friendship - the ambition of the World Cup itself. James Parry, Head of Marketing - BBC Sport and Events, says: “The World Cup is steeped in stories, and our campaign brings to life some of its most memorable moments with a unique interpretation of a centuries-old Russian tradition, accompanied by a traditional and iconic piece of music which we all fell in love with instantly." The new campaign makes its debut on UK screens at half time in the FA Cup final on BBC One on Saturday, 19 May.